Weddings are one of life’s most wonderful milestones, meant to be celebrated with family and friends. Often, between gown fittings, cake tasting and budget-planning, even the most thoughtful couples can lose sight of their guests. While the wedding is technically about you, the couple, you should take care to be considerate of your guests and let them know you’re so glad they made the effort to be with you on your special day. The most seemingly obvious yet simple way to be thoughtful of your guests is to, well, think about them! Put yourself in their shoes. There are a few factors that will impact your guests the most – travel, weather, food/beverage and the first impression – and by spending a little time thinking these through it will make your event one to remember. an appropriate variety of room rates and did you communicate this information to them? Have you considered drive time between your lodging options and the ceremony and reception sites? Did you provide easy-to-follow, accurate directions to your venues? Often when couples have a large number of guests traveling to attend their wedding, they will have both the ceremony and reception at one venue, simplifying logistics for their friends and family. Taking it a step further, having the event at a hotel will eliminate the problem. And, many hotels will give you a better room rate for your guests if you’re having your event at their hotel. If you do have a lot of out-of-towners, it’s very helpful to provide transportation for them. Buses are a great way to get a lot of people from one place to another – and make sure they get to the ceremony on time. Bussing is also a fun way to foster mingling between your guests who may not know each other or to give relatives a chance catch up. Also along the lines of travel is parking. If your venue does not have a large free parking lot, you’ll need to plan for valet service. By all means, please build this into your budget! It is frustrating for guests to have no choice but to valet and then have to pay for it themselves. 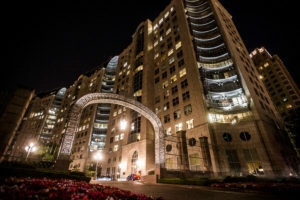 Even if your event site does offer a park-yourself option, providing valet service for your guests is a very generous touch and your guests will appreciate it. Make sure you explain the parking situation on the direction cards you include in your invitations. 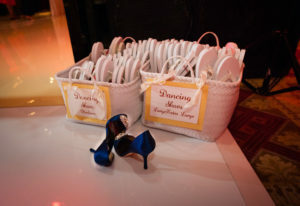 And as many guests will invariably lose it along the way, make sure to have copies of the directions on hand at the ceremony site and include one in your welcome items (more on that later). 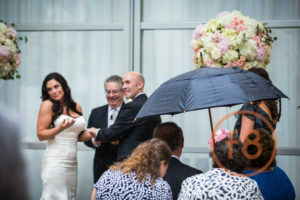 consider how weather could affect your event – and your guests. 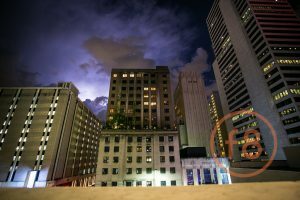 Did you know that May is the rainiest month in the DFW area? January is the coldest month, while July is on average the hottest (though you probably would have guessed it was August). If you’re set on an outdoor event, you must make a back-up plan in case of rain. Tents take time to construct and if earlier in the week it looks like it might rain, play it safe and get the tent! Other thoughtful touches if you anticipate rain could be a stand of umbrellas for your guests to get to their cars relatively dry or baskets of flip-flops so ladies can save their Louboutin heels from mud. If you insist on an outdoor event during the warm months, make sure you have fans, ice-cold drinks and other means to keep your guests cool and comfortable. If your event is during the winter months, you should rent a coat rack for the reception. It’s unkind to expect your guests to just keep their coats on the back of their chairs and it will take away from the look you probably spent a lot of money on. Let’s be honest, while your guests are looking forward to witnessing your lovely marriage ceremony, it’s the reception that they’re most excited about – the music, the dancing, the food and drinks! What a disappointment to stand at the bar and order a drink only to hear, “that will be $6.00, sir.” What?! Just say no to the cash bar. It is in poor taste to expect your guests to pay for their own drinks. You wouldn’t invite guests to your home for dinner and ask them to pay for their cocktails while they’re there, would you? Of course not! 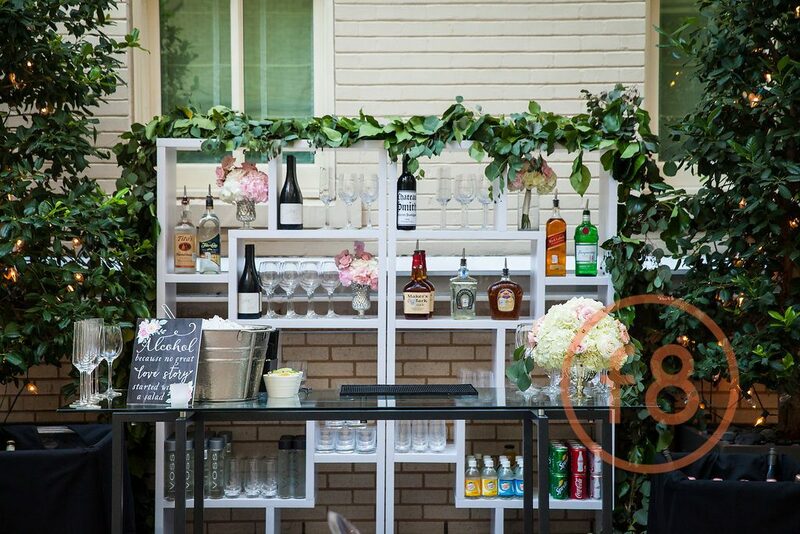 If you cannot afford a full open bar for the duration of your reception, there are plenty of more affordable options. 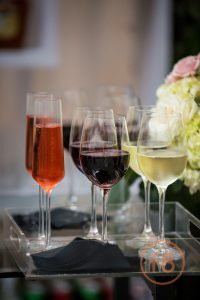 You can offer only beer and wine; you can have a champagne-only bar or save by nixing the champagne and having guests toast with drinks “in hand” at the time of your formal toasts. Or you can forgo alcohol altogether and just serve iced tea, coffee or soft drinks. There are so many options when it comes to food at receptions now – seated dinner, buffet, stations. While many factors will affect your choice of meal – style of reception, personal preference, the venue itself – you also may want to consider the palate of your guests. You and your fiancé may be avid connoisseurs of exotic foreign delicacies but most likely your guests will appreciate a more recognizable menu. That doesn’t mean your food has to be boring. Mix it up a little, and make sure the caterer will label the food on buffets and stations. Guests want to know what they’re being offered, and they’re more likely to try new things when they know what they are. Also, it’s considerate to steer clear of common allergens, such as peanuts or shellfish, especially if you know you have guests with allergies. This one is short and sweet – plan for a little something for your guests to receive when they arrive at their hotel. It doesn’t have to be much, just a personal note thanking them for traveling to share your big day. You can arrange for them to receive it at the desk upon check-in or pay a small fee to have it left in each guest’s room. You can get more elaborate than a note – baskets, bags or cowboy hats filled with goodies and bottled water, brochures on local attractions and your agenda for the weekend. But just be sure to include that little note that you took the time to personally write to them to let them know you are glad they came. This entry was posted in Advice on December 27, 2016 by admin.